I just purchased a subscription to EAGLE and i am trudging through learning it's clunky user interface. 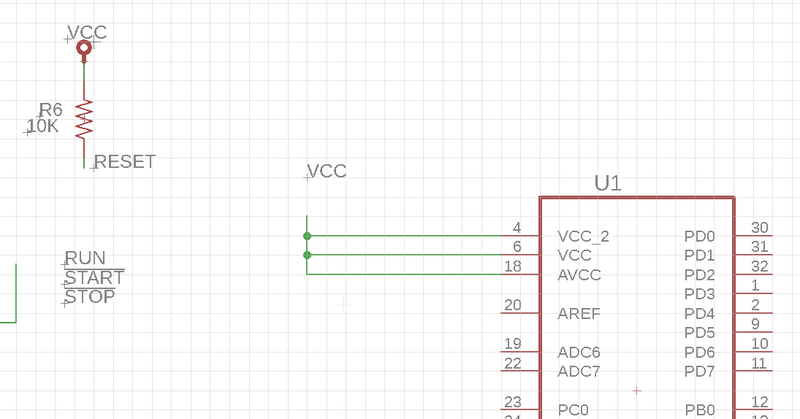 i was wondering if anyone could help me out in telling me how to create the little VCC tags with the circle to attach to the Vcc pins on the AVR. Those are in a component library. In mine, the library is supply2. Supply1 is all arrows. It has taken me many years to get halfway comfortable with Eagle. The reverse order, action first, then object to act on, still bugs me. But, its the GERMAN way (And certainly not the Microsoft or Apple Way)! By the way, feel free to PM me with any questions I might be able to help with. I just paid for a subscription to remind me why I despise EAGLE, and cherish DipTrace. One thing I just noticed is that the symbol on the schematic is meaningless... From the properties it seems that the symbol is nothing more than a decorative topper. In DipTrace the symbol is attached to the NET and if you hover on the symbol it will show you all teh associated connections. Ok, the intent is not to turn this into an EAGLE vs DipTrace waar. I think you need the INVOKE command. Sometimes if I cant find one with the voltage I want (say 33V), i'll take one of the symbols & change the value to 33V ...It will warn me that I can't change the value, but do I want to anyway. yep, I do. if you click on the "eyeball" menu icon (near the top), you can then click on a net & it will highlight everywhere that net appears...but you can't click on these power symbols (at least in my older version). Is this software REALLY this bad to use? I am looking for simple SMD resistors and Capacitors. In DipTrace I simply pick Resistor, or Capacitor, and sleect teh SMD package I want to use. I can then place as many in my schematic and the software auto numbers them for me. When done I can go back and edit the values, vendor etc. NOT IN EAGLE! It seems there are no generic resistors or capacitors in this huge damned library I have to wade through. It looks like they want me to know the vendor ahead of time, and look to see if they have a library, etc. What a waste of time. I have been at this for two days getting nowhere but frustrated. If I could use DipTrace I would have been done in a few hours and on to the PCB rework. Part of the "problem" is that the library is so huge, to accommodate all the different US and European symbols for a huge range of parts from a very large range of manufacturers (who tend not to standardize). But, then the part you really want is never there. I have gotten pretty used to making my own. Complete with thermal pads that have vias scattered around. Once you learn, its not that hard. Its the learning that is hard. How hard is it to make a generic Resistor and capacitor library? Forget the manufacturer for cryin' out loud. The designer adds the technical information after the schematic is drawn. Hell PADS even does this and that package was the most difficult to use yet of the ones I have been tortured with over the years. Look at all the resistor packages in the library. I don't think making the footprint choice is any easier during schematic creation or during layout. But, what ever you like or don't like is your choice. My point is that I cannot seem to simply place a resistor or capacitor in the schematic. I need to have a vendor, a footprint/package etc. you mean to tell me that EAGLE does not allow this right out of the install? I only paid $100 for the subscription, but this software is costing me a lot more in time. Just me crabbing out loud I guess. Yeah , it is a bit of a pain... no a big pain, well a double bent over pain finding these parts. You'll be happy to know that you should know to know that there is a generic RCL library listed (somewhere)...In it you'll find pretty generic R C and L's. Didn't they tell you that? The factory man was supposed to call after you subscribed. Hmmm, now where to find a 4 bit dip switch? Yeah, I do not have a library called 'RD' but there is a library called 'RCL' and after a bunch of bullcrap I was able to add a resistor to the schematic. Didn't they tell you that? The factory man was supposed to call after you subscribed. I think this is what is called "Sarcastic Bull***" correct? You need glasses Jim. It is NOT "RD", but "R C L" (spaces added for your eyes. I wish I lived around the corner from you. I have a directory called RCL. And I have glasses Thanks. Then what does RD have to do with this? I found the headers...but alas the library does not give me the pin spacing in a nice way. I have not yet heard from the factory man either. I had to grit my way through it---more than a few arrrrrgs along the way! More seriously , Bob Starr has done a tremendous job improving the Eagle lib offerings (though still maintained somewhat in the haphazard (compatible) organization)...however he has tweaked many parameters that were previously left unset , improperly set, etc. They are very easy to bring into your system and add to our Eagle lib search path. Many of the original Eagle libs left, ahem, a little to be desired (such as uniformity). These library files are designed to completely replace the default Eagle library set and are updated frequently. All library components are carried forward with any new release of Eagle to maintain compatibility with existing designs. These libraries are suitable for commercial/production grade work with many new proven components and packages. I will certainly look into that in the morning. Time to call it a day. I have moved from crabby to one level worse so enough of this crap for now. Thanks all for the help. Resistors, simple components that they are, cause a lot of confusion for Eagle beginners, perhaps because the eagle library contains 100+ different package/schjematic options for generic resistors. Or perhaps it's because a search for short word like "R" isn't practical, and a search for "resistor" turns up a bunch of special purpose specific-manufacturer devices. Note that the instructable dates back to v4.15, so various bits may have changed. Sorry, you probably have your reasons for wanting to buy Eagle, but I just could not resist. I purchased a subscription because the clients schematic and pcs are all done in Eagle and even though DipTrace can import the files I cannot go backwards so I thought it best to simply drop the $100 and make my life easier.....well that thought backfired. Have you tried the support forum? Tech support is quite good. Admittedly no, I have not. I think I am about at the end with the schematic. Will try the PCB part of the suite tomorrow. - and quickly try the Eagle File import, which I believe is now very good. Easy to see how it works.